Kellie, this is awesome. 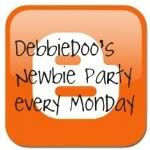 You need to share it at one of the link parties. More eyes should be on your fab projects. Thank Rosemary! You are right...I do need to do more of this. Sometimes...I just run out of time. My new goal! Thanks for your kind comments as always! I love your encouragement! You are truly an inspiration and role model! You got it girl! I have made drop cloth pillows curtains, painted them, stenciled them and they look good. Your chair IS AWESOME! Thanks for sharing with my newbie party. I love the finished project, and your tutorial is very detailed too. 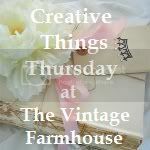 I'd love it if you'd share this at my Show & Tell linkup party and giveaway going on now @ the Delectable Home. Thanks for the inspiration! Hi Debbie and Tisha! Thank you for your kind comments! Thanks for visiting too! Tisha...I just linked up! Thanks for suggesting! So pretty! I love the color of the red stripes! I am not sure I would trust myself to do this, but you made it look really good! Visiting from MM! LOVE IT! Great tutorial too! I have been wanting to try that, I think I will now! Came over from BNOTP and following you now! Hi Samantha and Jen! Thanks for visiting. I promise to come visit you this week! Good luck on your projects. I hope this helps! It really was very simple! Great Tut! I just did a few chairs and I think they need some stripes! Your newest follower. Your chair is really beautiful now!!! Shannon and Cindy! Thank you! Glad you enjoyed the tutorial. Thanks for following. Heading over to visit!